Have living things always existed in their present form, or did they evolve? And if evolution occurred, was a divine hand at play? Measuring public opinion on evolution has never been an easy task for survey researchers. With Americans’ views on the topic tapping into the highly charged realms of religious conviction and scientific knowledge, question wording becomes extremely important. For this reason, in recent years, Pew Research Center has experimented with different ways of asking about evolution and studied whether these variations affect the public’s responses. And because they do, the Center is moving toward a revised wording. First, a bit of survey history: For a decade and a half, the Center asked Americans what they believe about the origins of humankind, most often in a two-step process. An initial question asked respondents whether they think humans and other living things have evolved over time – in line with Charles Darwin’s theory of evolution – or whether they believe humans have existed in their present form since the beginning of time, as in the Book of Genesis’ creation story. Those who said they accept the idea of evolution then have been asked a second question: whether they think evolution has occurred due to natural processes such as natural selection, or due to processes that were guided or allowed by God. The data show that respondents in the latter group (those who receive a single question with three options) are more likely than those in the former group to say evolution has occurred. 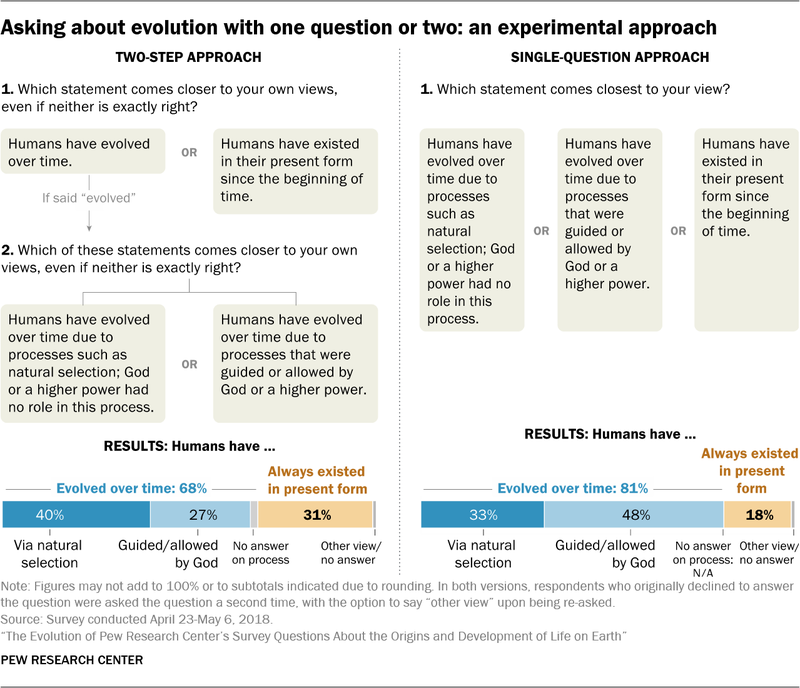 Overall, eight-in-ten in the single-question group say humans have evolved over time (and just 18% say humans have always existed in their present form), while only two-thirds of those who receive the older, two-step approach say humans have evolved (and 31% express the creationist view). Put more simply, our estimate of the share of Americans who reject evolution and express a creationist view drops considerably (from 31% to 18% of U.S. adults) when respondents are immediately given the opportunity to say God played a role in human evolution. The effect of the different question wording is especially pronounced among white evangelical Protestants and black Protestants. The experimental findings illustrate why testing multiple ways of asking about evolution is necessary and important. For some people, views about the origins and development of human life are bound up with deeply held religious beliefs. 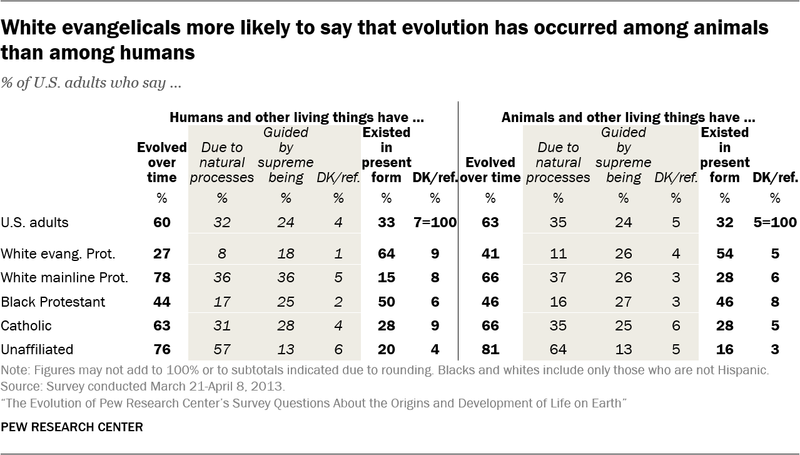 Pew Research Center’s goal in designing questions on this topic is to allow respondents to share their thoughts about both the scientific theory of evolution and God’s role in the creation and development of life on Earth – and to do so in a way that does not force respondents to choose between science and religion. Indeed, the data show that many Americans believe that life on Earth has evolved over time AND that God or a supreme being played some role in the evolutionary process. In the future, Pew Research Center intends to use this new, three-option approach to asking about evolution in much of its U.S.-based survey research – though the older, two-step approach may continue to work well in certain international contexts (for example, in countries where views about evolution are less closely bound up with religious beliefs than is the case in the U.S.) or for monitoring long-term trends in the United States. The results of the new experiment indicate that there are some people who do believe that humans have evolved over time, but who, for whatever reason, did not say so in our traditional method of asking about the topic. 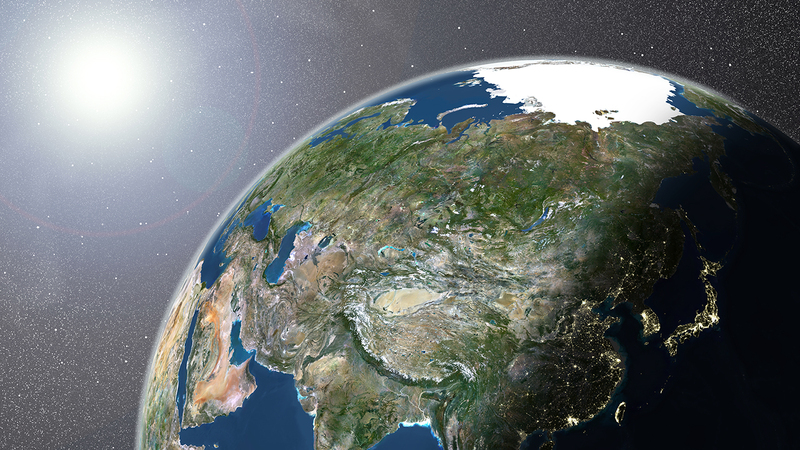 Perhaps without the opportunity to immediately connect evolution to God, some religious respondents may be concerned that expressing belief in evolution places them uncomfortably on the secular side of a cultural divide. What follows below is a brief history of the way the Center has asked about evolution. Why begin a survey module about evolution with questions about belief in God? Researchers were concerned that questions about evolution may have become so caught up in contentious debates about religion, culture and politics that simply asking about evolution outright might lead to erroneous results. Religious people who believe both that evolution has occurred and that God played a role in it might nevertheless – when asked cold – choose the creationist option simply as a way of registering their belief that God exists, and not because they truly reject evolution. Without having first been given the chance to stipulate that they believe God exists and played a role in the creation of life on Earth, some respondents may have seen it as socially undesirable to say they believe humans have evolved over time. Overall, the 2005 survey found that roughly half of U.S. adults said humans have evolved over time, including 26% who said evolution was due to natural processes, and 18% who said it was guided by a supreme being. Four-in-ten said humans have existed in their present form since the beginning of time, and an additional 10% either were not sure or declined to answer the question. The following year, the Center again explored people’s views on evolution. 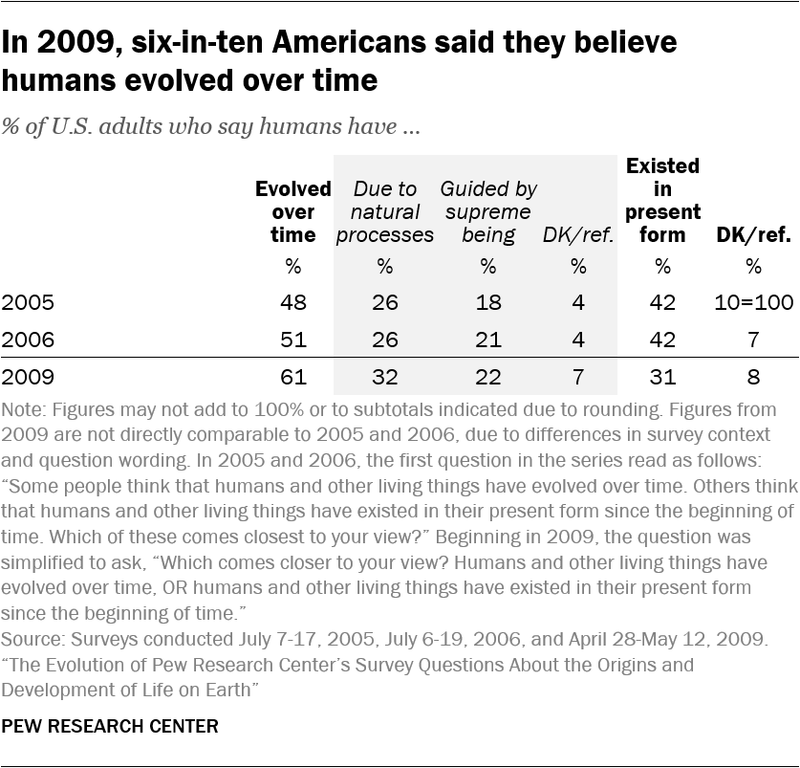 The 2006 survey included an experimental test of the premise that asking about belief in God would affect respondents’ answers to the ensuing questions on evolution. Half of the survey’s respondents were randomly assigned to receive the belief-in-God questions before the evolution questions, while the other half of respondents did not receive the belief-in-God questions. Analysis of the data showed that respondents answered the evolution question series similarly, regardless of whether they were first asked about their belief in God. 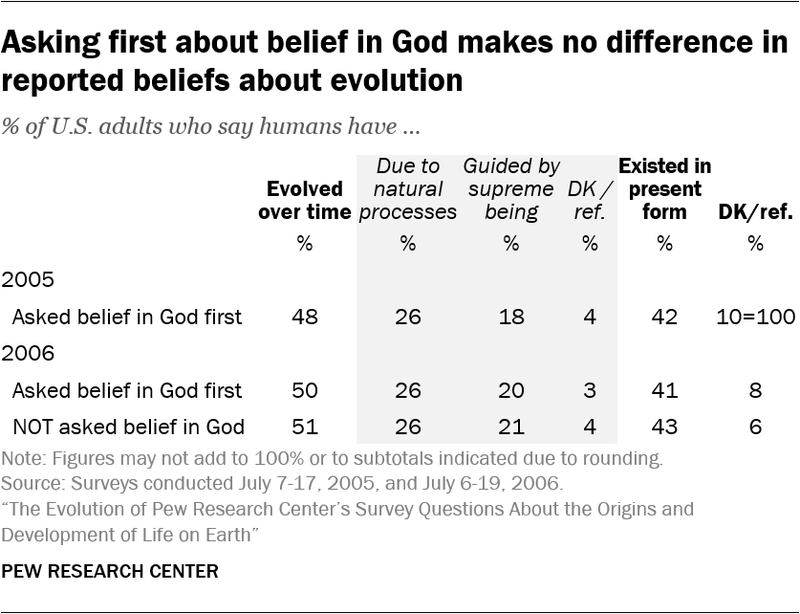 Since the experimental test showed that asking about belief in God had no impact on the way respondents answer questions about evolution, all Pew Research Center surveys conducted since 2006 have omitted the introductory questions measuring beliefs about God. The Center asked a very similar, two-step battery of evolution questions three years later. The survey results appeared to show an increase of 10 percentage points in the share of Americans who say they believe evolution has occurred, from 51% in 2006 to 61% in 2009. However, researchers were concerned that responses to the 2009 question may have been influenced by the fact that the entire 2009 survey was about scientific topics. Specifically, people who are most interested in scientific topics may have been more likely to participate in the survey. Such individuals may also believe in evolution at higher rates than those who are not so interested in scientific topics, thus inflating the survey’s estimate of the share of the public that believes evolution has occurred. It is also possible that a slight change to the wording of the question between 2006 and 2009 could have affected the results. In 2005 and 2006, the first question in the series read as follows: “Some people think that humans and other living things have evolved over time. Others think that humans and other living things have existed in their present form since the beginning of time. Which of these comes closest to your view?” Beginning in 2009, the question was simplified to ask “Which comes closer to your view? Humans and other living things have evolved over time, OR humans and other living things have existed in their present form since the beginning of time.” The original wording may have lent equal legitimacy to both viewpoints by telling respondents that there are people on both sides of the debate; this may have nudged some to the creationist response. As a result of the different survey context and the slight change in question wording, Pew Research Center did not report the 2009 results as the continuation of a trend that began in 2005. Instead, the earlier results were included alongside the 2009 findings only as a “trend for comparison” – as an indication that there may have been some change in sentiment between 2006 and 2009, but without making a direct, apples-to-apples estimate of the magnitude of the change. 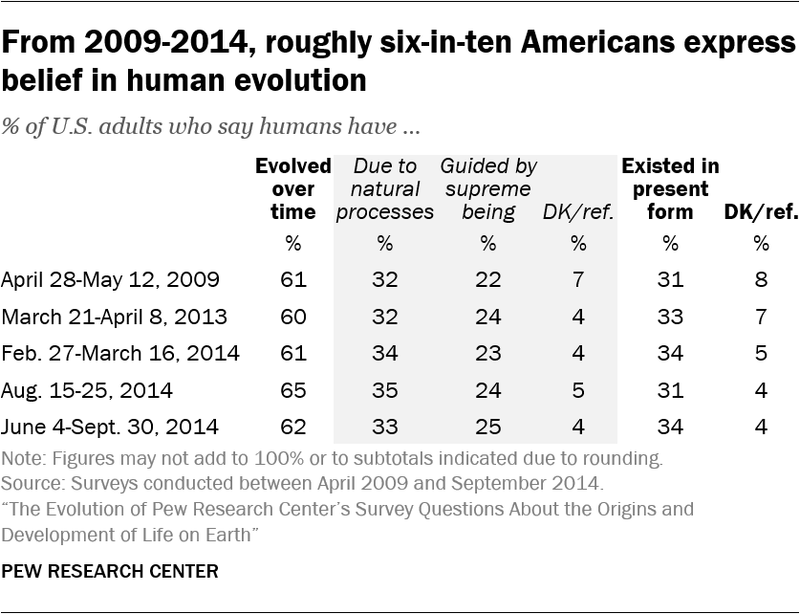 Between 2013 and 2014, Pew Research Center asked the two-step evolution question series four more times. On all four occasions, the share of those who said they believe humans have evolved over time fell between 60% and 65%. In the 2014 U.S. Religious Landscape Study (the last telephone survey in which the Center asked the traditional, two-step series of questions about evolution), the data show that belief in evolution is more common among college graduates (73%) than among those with lower levels of educational attainment (62% among those with some college education, 53% among those with a high school diploma or less education). Belief in evolution is also more prevalent among young people (72% among adults under the age of 30) than among older adults (52% among those ages 65 and older), and somewhat more common among men than women (65% vs. 58%). Among religious groups, belief in evolution peaks among self-described atheists (95% of whom say they believe humans and other living things have evolved over time) and agnostics (96%). Roughly eight-in-ten or more Buddhists (86%), Jews (81%) and Hindus (80%) also say they believe in evolution, as do smaller majorities of Catholics (66%) and mainline Protestants (65%) – though members of these Christian traditions are much more likely than religiously unaffiliated people and members of most non-Christian faiths to say they believe God played a role in guiding the evolutionary process. Among members of evangelical Protestant denominations, the balance of opinion leans in the opposite direction – 57% of evangelicals said in the 2014 telephone survey that humans and other living things have existed in their present form since the beginning of time, compared with 38% who said they believe humans have evolved over time. And members of historically black Protestant denominations were divided about evenly between those who believe in evolution (50%) and those who do not (45%). Statistical analysis shows that evangelicals and people who belong to historically black Protestant denominations are less likely than those in many other religious groups to believe in evolution even after accounting for different levels of educational attainment. The survey found that white evangelical Protestants were more likely to say animals and other living things have evolved over time (41%) than they were to say the same about humans (27%). Among white mainline Protestants, the opposite was true: More said humans evolved (78%) than animals (66%). The experiment found no significant differences in the way black Protestants, Catholics and religiously unaffiliated respondents answered the questions. Taken together, the findings presented here show that asking questions about the origin and development of life on Earth can be a complicated undertaking – perhaps especially in a country like the United States, where the public’s attitudes about the scientific theory of evolution often are bound up with their religious convictions. What may seem like small differences in question wording can have a major impact on survey estimates of the share of the public that believes in a naturalistic account of human development, a creationist view or something in between – an evolutionary process guided or at least allowed by God or a supreme being. Pew Research Center has been committed to innovation on these kinds of questions to try to capture public opinion in its full complexity, and the Center will continue to experiment and report the results transparently.